The Patriots breathed a sigh of relief when Rob Ninkovich (50) recovered a Mark Sanchez fumble that sealed a 29-26 win over the Jets in overtime. The win elevated Tom Brady and the Patriots (who blew a fourth-quarter lead for the second straight week) to 4-3, good for first place in the AFC East. 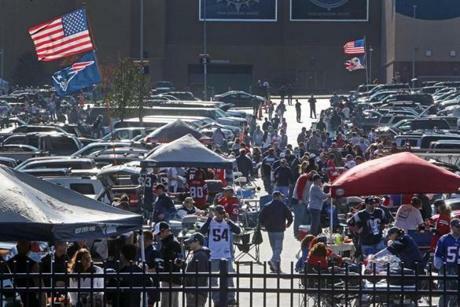 The day began with fans streaming into the parking lots for tailgate celebrations on a beautiful autumn afternoon. 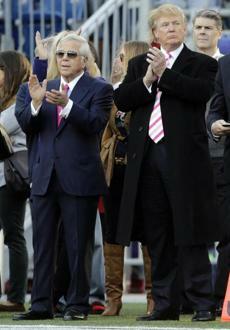 Patriots owner Robert Kraft, left, was joined on the sidelines by his friend Donald Trump prior to the game. 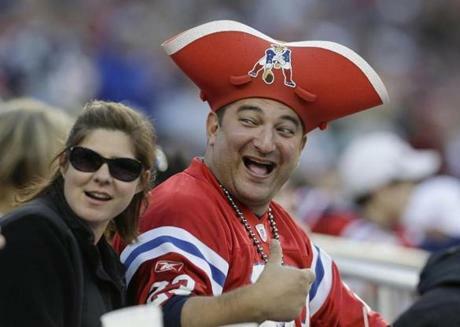 Many fans were decked out in their red Patriots throwback jerseys, which the team also wore. 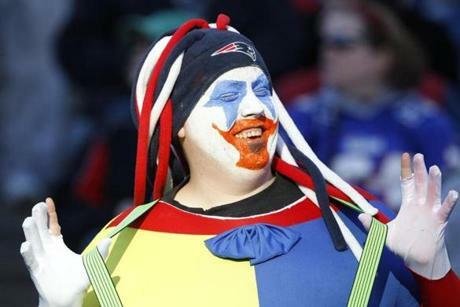 This fan came to the game dressed as a clown. 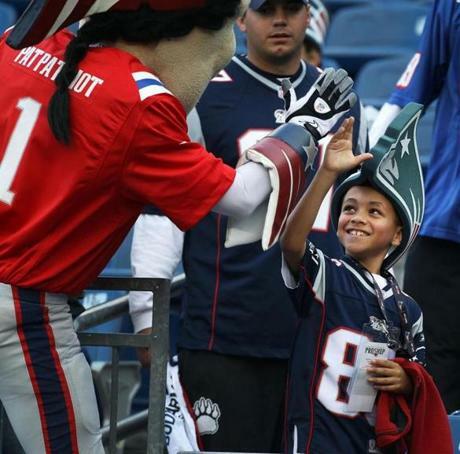 The Patriots' mascot, Pat Patriot, also donned his red jersey before interacting with fans. Patriots cheerleaders were dressed in Halloween costumes in the team's last home game before the holiday. 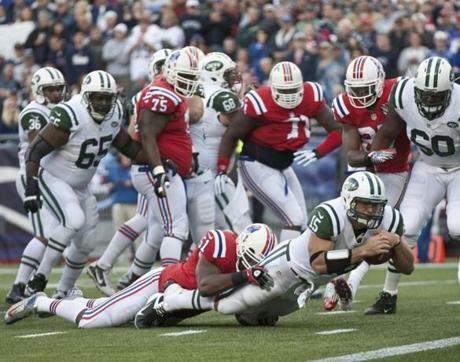 Tim Tebow didn't see much action for the Jets, but nearly found his way into the end zone on this first-quarter run. 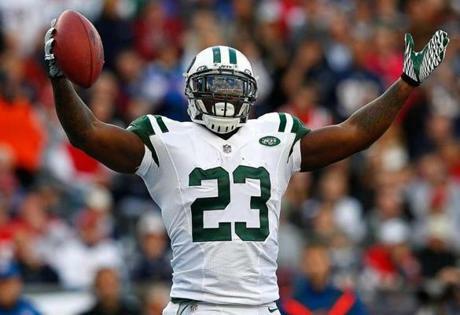 Jets running back Shonn Greene scored the game's first touchdown on a 1-yard plunge in the first quarter. 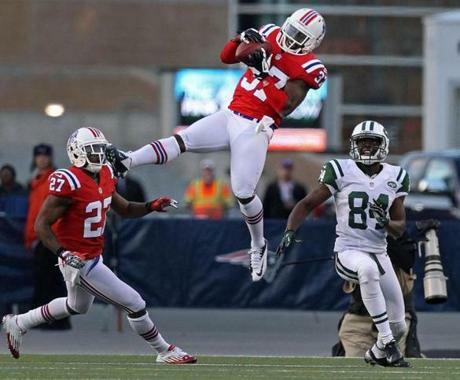 After the Jets opened the scoring on their opening drive, Devin McCourty responded with a touchdown on the ensuing kickoff. 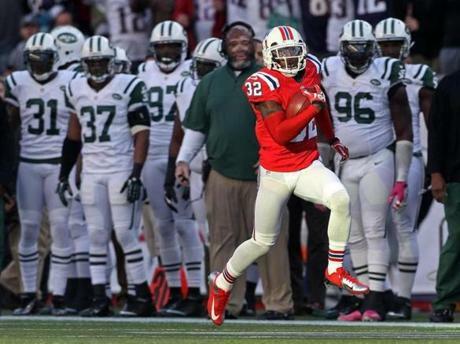 McCourty's touchdown came on a 104-yard kickoff return, which was the second longest in team history. 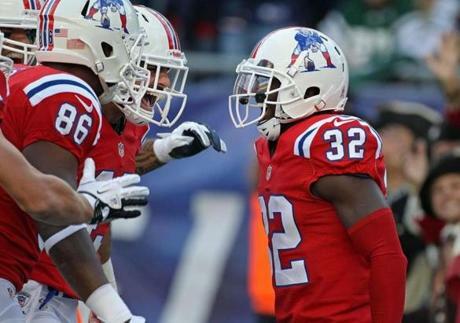 McCourty, right, celebrated with teammates after his runback evened the score at 7-7. The Patriots took a 14-7 lead in the second quarter when Rob Gronkowski hauled in this 17-yard pass from Brady. 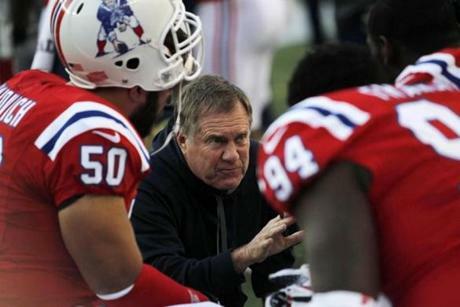 Patriots coach Bill Belichick instructed his defense on the sidelines during the first half. The Jets put 2 more points on the board for the Patriots in the second quarter when Mark Sanchez kicked this loose ball out of the back of the end zone, which triggered a safety and a 16-7 lead for New England. 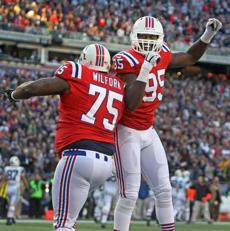 Vince Wilfork (left) and Chandler Jones celebrated after the safety, which came after a fumble on a play where Wilfork applied pressure to Sanchez. 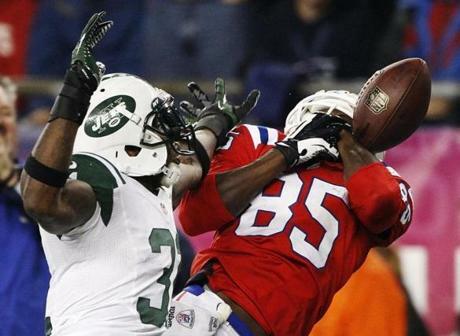 Patriots cornerback Alfonzo Dennard intercepted this pass at the 2 to end a promising Jets drive in the second quarter. 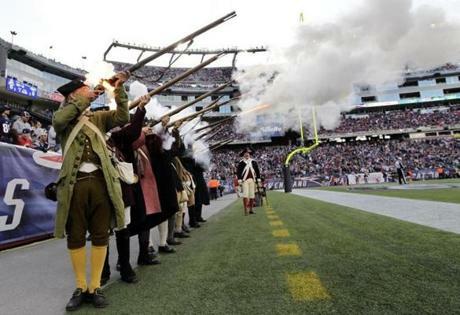 The Patriots' Minutemen militia had plenty to celebrate during the first half, and then saw New England take a 16-10 lead into halftime. 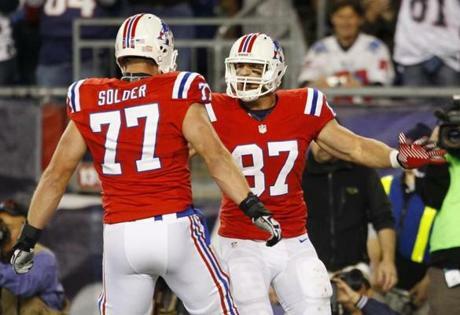 The Patriots took a 23-13 lead into the fourth quarter when Gronkowski, right, scored another touchdown to give them the 10-point lead. 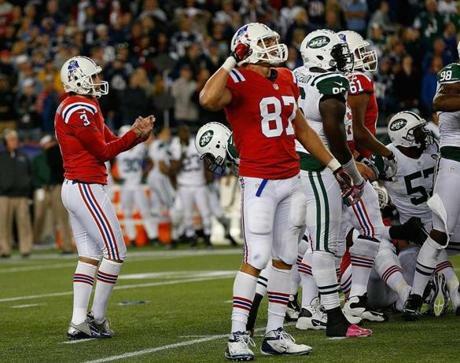 Gronkowski's score came after a close call on what was originally ruled an Aaron Hernandez fumble at the goal line. 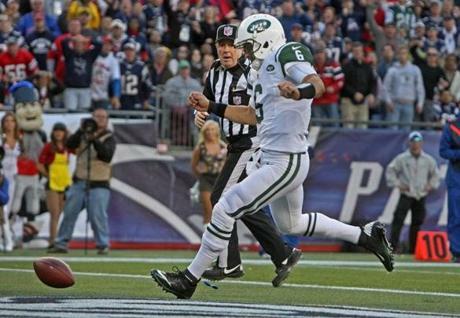 After review, officials gave the Patriots the ball at the 1 instead of awarding it to the Jets as a touchback. 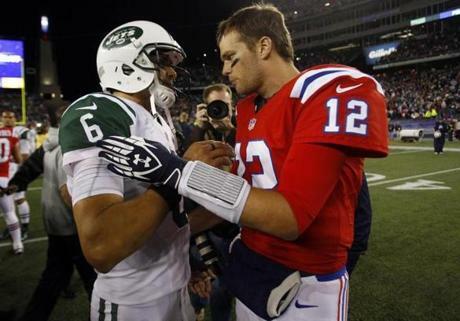 The Patriots experienced some trouble in the fourth quarter however, as the Jets erased the 10-point deficit and even took a 26-23 lead. Brandon Lloyd was unable to corral this pass. Stephen Gostkowski, who kicked an overtime-forcing field goal at the end of regulation, then kicked this 48-yard field goal in overtime. Gostkowski's kick proved to be the game winner, but because of new NFL overtime rules the Patriots had to first stop the Jets' offense. 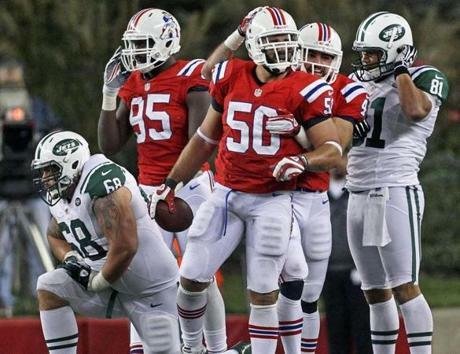 Ninkovich pounced on Sanchez's fumble at the Jets' 25 to seal the win. 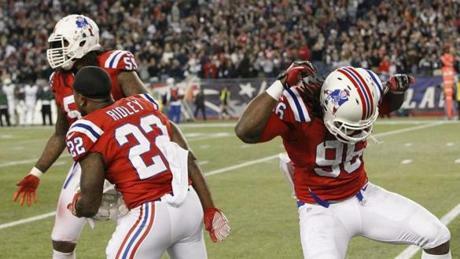 That set off a celebration among Jermaine Cunningham (96) and his Patriots teammates on the sidelines. 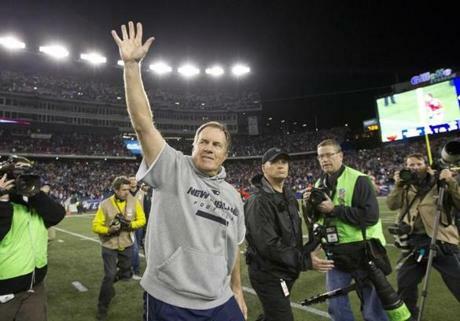 Bill Belichick waved his support to the Foxborough fans before heading back into the locker room.